Working in a dense and unkempt flower bed, I spotted a solitary egg out in the rain. Over the weekend I found a nest. A little background: I have not yet built a proper fence that is high enough to keep my hens penned. They simply lift like multicoloured Harrier jets and launch over the four-foot fence. They roam far and wide, doing their own thing, and get into enough trouble that I have been calling them The Hussies. Only one of them comes home to lay, and till recently, I had no idea where most of the eggs were laid. My good friend was visiting from Boise and stayed with me for four days. Sunday we were in the mood to do yard work. The weather was wholly uncooperative, and the heavens opened up and poured all day long. We donned hats and jackets and boots (my friend was shocked I did not have Wellies) and went out anyway. We raked muddy leaves and hauled heaps of wet sticks and branches and built up two new slash piles for burning at some future date. My friend doing yard work in the rain, in Wellington boots. The Hussies like it when I do yard work and particularly when I dig, because whenever I come across a worm I make sure one of them gets a crack at it. The ladies were hanging around, clucking, pecking, scraping their beaks across stones in a manner that suggests wiping their chins of grime. They did not alert me to the discovery I was about to make, of a treasure stockpile of which at least one of them was well aware. As I untangled dead sticks and blackberry brambles from ferns, I spied an egg on the ground, exposed and lying atop some coals discarded from a long-ago fire in the woodstove. I hollered at my friend to come over and see. He was dripping wet head to toes, with hands stained yellow from the dye leeching out of his sopping wet calfskin gloves. Happy for an excuse for a break, he came over to where I was working, and I walked closer to the egg to show him where to go. I walked closer and got a new view. Something pale-coloured beneath the ferns. Something light in the dark. 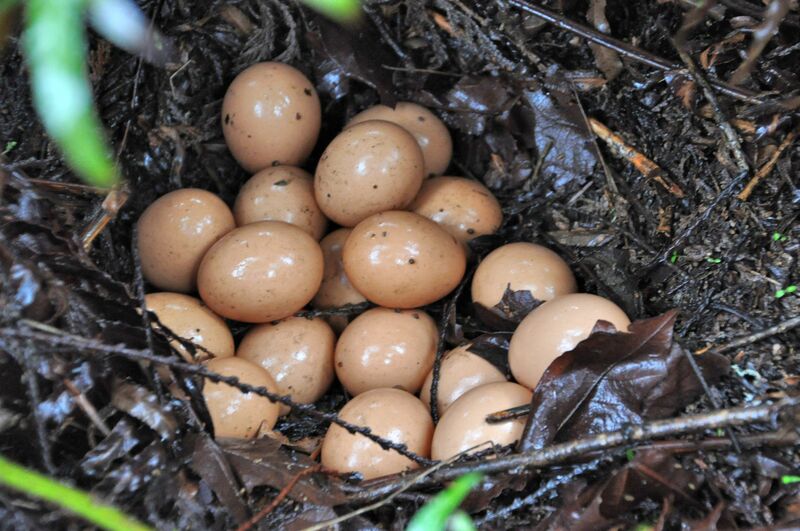 I bent down and spotted the motherlode of eggs! There were NINETEEN eggs piled up! 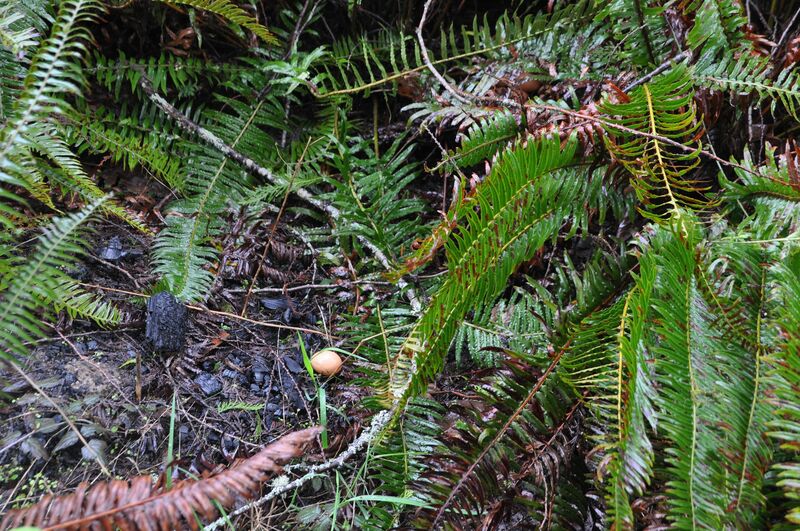 Carefully tucked into a nest of decaying pine needles and ferns, was a pile of eggs, laid one at a time in patient confidence. It looked like a turtle nest. I was so excited I was hopping around with glee. Wait, what is that in the ferns? Look at these brown and beautiful eggs! Lacey! Are these your eggs? Thank you ma’am! For anyone curious, eggs are laid with an antibacterial membrane, an invisible coating called a bloom, that seals the eggs and protects the freshness as well as holds in moisture. Eggs can be stored at room temperature for weeks like this, as long as the eggs are not washed. Eggs can be refrigerated for months unwashed, and will stay fresh. The weather around here has been in the 40s and up to around 50 degrees some days, so I call that refrigerated. However, with all the rain, they may have been “washed.” We used the egg floating test. Put an egg in a bowl of cool water. If it lies horizontally on the bottom, it’s very fresh. If it tips up, but stays in contact with the bottom: still fresh, but less so. If it floats: no good, throw it out. All my eggs were good! As of this morning, we’ve eaten them all. Could be either! 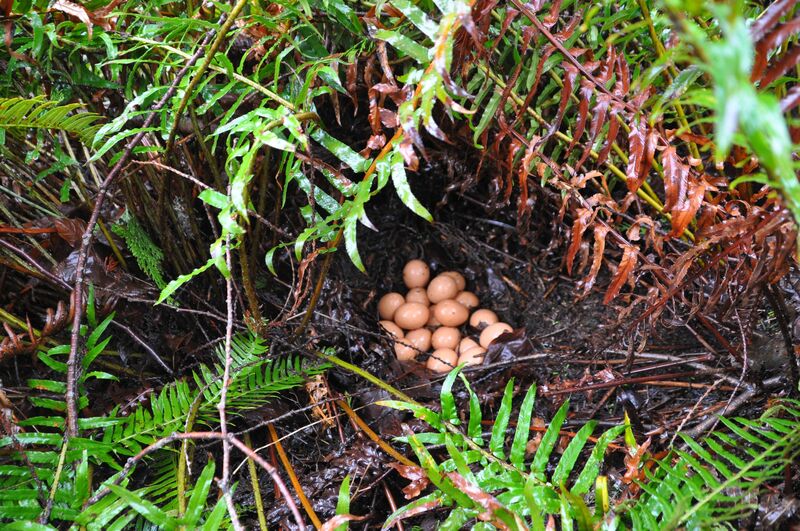 Now that I’ve cleaned out the stash, no more eggs have showed up in that nest under the ferns. However, my neighbors came over a few days later to tell me they had found a nest too. 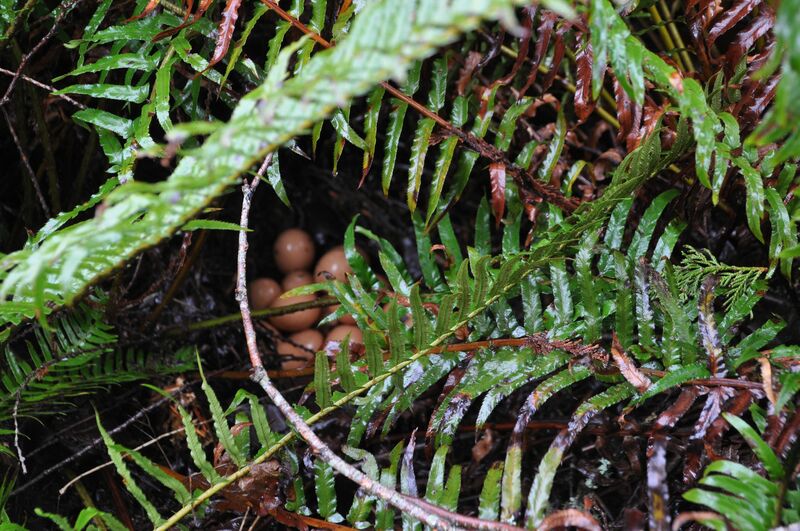 In the ferns behind the mailboxes, they found a pile of 17 eggs! My standing policy with the neighbors is: whomever finds an egg has dibs, so they’re all ready for Easter, that’s for sure! Thank you Derrick. It is a wonderful find. It makes me wistful for how many fabulous eggs I would have if only I could keep the Hussies home. The tasks at hand, yes, so much yard work to do. But it’s a form of meditation for me, or yoga, or something. 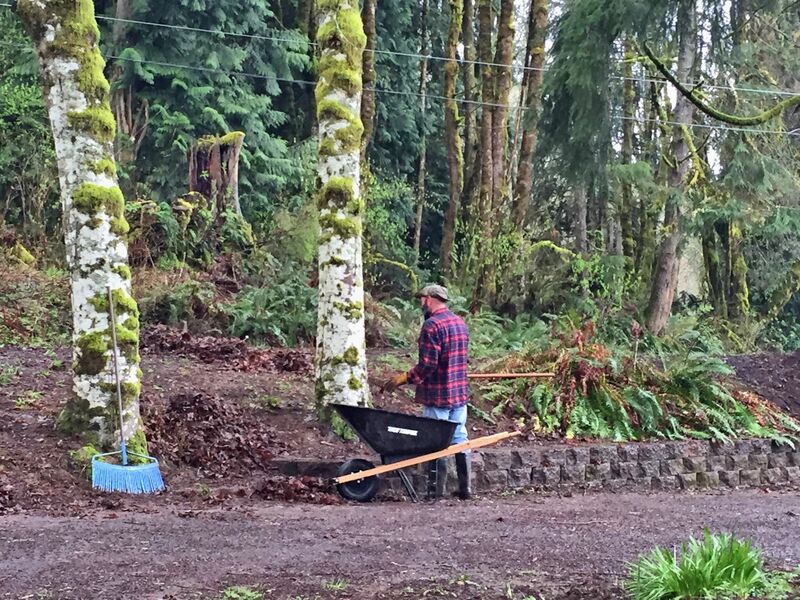 I find my bliss when I’m doing yard work. I like that fresh egg test, I always suspect that we throw away too many perfectly good eggs. How did you eat yours? What is your favourite? Yes, the test was handy, since the eggs could have theoretically been lying in a heap outside for a very long time. From what I understand, eggs can keep much longer than is comfortable for many of us. 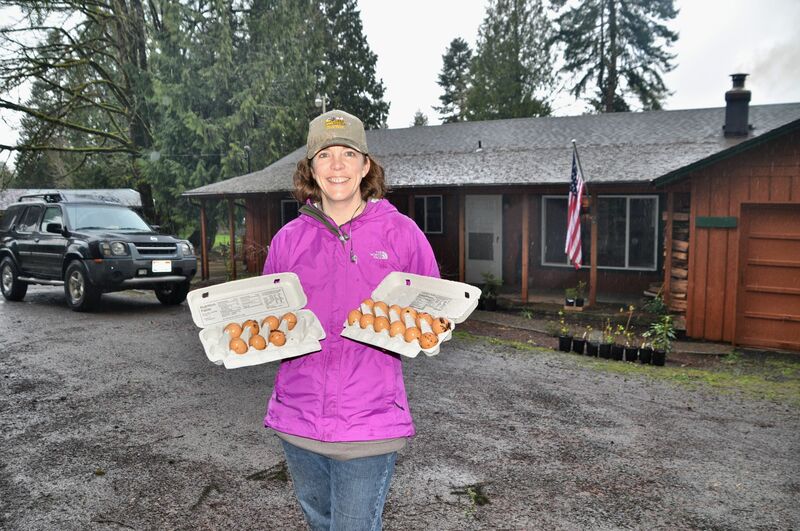 People have told me that at eggs farms, or places where they take egg deliveries, crates of eggs sit outside in the air for months before ever being brought into refrigeration. Sometimes there are things I’d rather not know, ha ha. But still, isn’t it wonderful to discover such a protection device that comes naturally with this great food source? Chickens are pretty cool. I have a friend who is a farmer and an environmental health officer and he says always ignore the sell by date! That’s a lot of eggs! Pretty soon you will be able to open your own roadside market. I think that’s true! Just think of how many eggs we would have if I could keep the Hussies at home and get four eggs a day?! Tara has had the bee hive delivered, and the plans are to have honey bees soon. 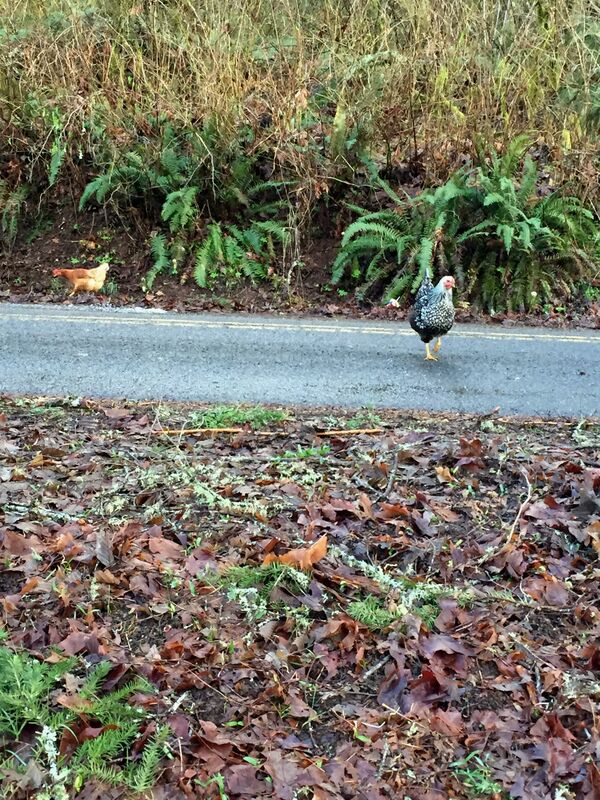 I imagine that would be a successful roadside market with fresh eggs and honey. For sure! There are worse things to do in life that’s for sure. I’m so excited for you!! Glad you found them and all the hens are still safe and alive having a good old time. I’ve been getting fresh eggs from my sister and wash them right away. Kinda poopy looking on some of them. You gave me quite an education today. I did not know any of that other than if they float, they probably aren’t good. Thanks for sharing all that. I need to get outside too. Lots of work waiting. Are you getting any days to work from home yet?? So happy you had help to get the work done. I’ve had a couple people remark on how the hens are still safe and running happily around after all this time. I’ve seen a raccoon and a coyote around their pen, and the neighborhood has dogs, and cars, and eagles. There are many creatures who would enjoy eating my girls, but so far they are oblivious and living the life of Riley. I suspect their constant vigilance, ability to move quickly, and to fly when necessary saves them. Poopy eggs are pretty common, since hens will poop anywhere (as evidenced by my front porch, ugh!). So you don’t want to wash them to keep them fresh, but you don’t want poop around your other food or there is the possibility of contamination. I’m sure what you do is exactly right: wash them and put them into the fridge. Yes, lots of work waiting here too. I’ve been collecting trash all year from the property, and I’m thinking about borrowing my uncle’s truck to take a load to the dump. Honestly, though, in just these few months there is a big change in how much trash is on the land. I simply do not understand people who think of their own land as an appropriate place to throw garbage. I can tell most of the rubbish came from the man I bought the place from. Recently I found a pile of granite pieces down by the creek, left over from the bathroom upgrades he did. I’m probably going to haul them up to the top and find a way to use the polished granite in my gardens. The next task is that the grass needs mowing, but it’s pure mud out there and the lawnmower would sink in. I’m waiting for things to dry out, but it’s just not the season for drying out. Not sure what the magical compromise will be, but I suppose it will all work out fine in the end. I hope you and TS are well down there. I’ve noticed Spring has already arrived in town. Some yards are already trimmed and gorgeous. I’m guessing your little neighborhood is getting pretty for the season too. It sounds like you have the same thoughts as me: pretty soon I’ll need to be working my tail off outside! Using what you can in the gardens is a good way to recycle stuff. We will get some dry, warm days early this week so with careful planning, you can get the mowing done. Any days you get to work from home yet? I’ll try to get outside and paint on the house this week and maybe do some weeding…again! I’m not looking forward to the intense heat but ready for some dry. It’s still very soppy here making me glad I took out the grass. Oh my goodness, yes I have been working two days a week from home! I thought I had told you. The whole month of March, I’m at home Wednesdays and Fridays. My supervisor says the whole team will be allowed to increase our time at home in the future. Yay! Paint outside? It’s still too early in the year for that here. I think I’m three weeks behind you in my season. We’re just barely getting some green buds on branches, and the brown field has finally turned to green. Two more weeks and the green will be a foot deep, so I need to commit to the riding mower sooner rather than later. Hey thank you! 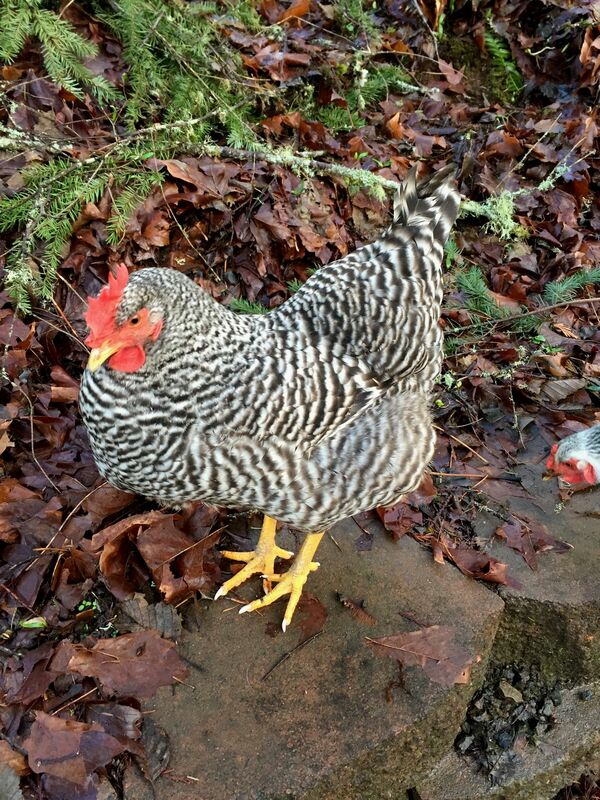 Of my four hens, Lacey is the chickeny-est one. She’s so fat and saucy and loud. I have seen where a couple of the other hens lay, and I think this one may be her nest. I’m glad you learned from the post. I did too. I knew about the bloom and the water test, but just to be sure it wasn’t old wives tales, I looked it all up. Sure enough, the tales are true. YAY! What an exciting find! I’d been reading about the protective coating on eggs that make them last so long, but had not heard about the freshness test. What a good friend you have! Question: Do you now have Wellies? ha ha ha. Glad you liked that. I just can’t get the image out of my head the day I saw them all lift and fly. It was amazing. From a standing still stop, they started beating their wings, lifted, and then flew from a hover. I had never seen anything like it before except the Harrier jet. My mind is silly the way it puts things together, but it’s really a good analogy. He taught me the fresh test! I hadn’t heard of it. But I looked it up and found the same description found on line too. And it’s got to be good, because Tara and I ate all the eggs and there were no bad side effects. Yeah, he’s a good friend for sure. Full confession: he was my very first love, at age 16. We clicked from the start and still click. He’s a great guy and it is so much fun to have a friend for thirty years.